The architecture of Mont-Saint-Michel Abbey is evidence of the mastery and expertise of several generations of builders. The construction of the Abbey over a period of 1,300 years, on an inhospitable site, represents an undisputed technical and artistic feat. The long history of Mont-Saint-Michel began in 708, when Bishop Aubert erected a first sanctuary on Mont Tombe in honour of the Archangel. In 966, Benedictine monks settled there on request from the Duke of Normandy, Richard I. These monks, under the authority of the Abbot, followed the Order of Saint Benedict, and were responsible for the growth of the new monastery. The Abbey very quickly became a major place of pilgrimage in the Christian West, but also one of the centres of medieval culture where a large number of manuscripts were produced and stored. Mont-Saint-Michel was given the nickname "City of the Books". At a political and intellectual crossroads, the Abbey was visited by a large number of pilgrims over the centuries, including several Kings of France and England. This ancient monument offers a diversity of architectural styles, as its construction began in the 10th century, continuing up to the 19th century restorations. The historical, political and economic situation throughout the Middle Ages had considerable influence on the works undertaken and the methods used. Over the centuries and following fires, collapses, reconstructions, changes in use or restorations, the Abbey has been transformed. 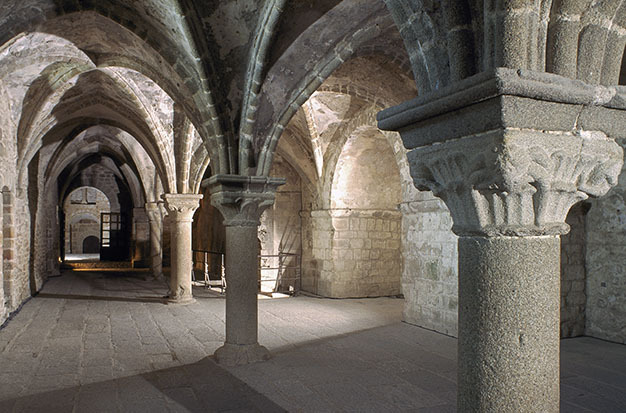 The Abbey church, built on the summit of the Mount at 80 metres in altitude, sits on an 80 metre long platform, consisting of four crypts built into the spur of the rock. The Merveille building is often cited as the jewel in the crown of the Abbey's architecture. This masterpiece of Norman Gothic art bears witness to the architectural expertise of the 13th century builders. Positioned on the border between Normandy and Brittany, Mont-Saint-Michel was both a place of passage and a fortress for the Duchy of Normandy. From the 14th century onwards, the successive conflicts of the Hundred Years War between France and England required new, powerful fortifications to be erected. The Mount, defended by a few knights loyal to the King of France and protected by a wall flanked by several defensive towers, managed to resist attacks by the English army for nearly 30 years. In 1421, during a terrifying siege, the Romanesque chancel of the church collapsed, and was not completely rebuilt until 100 years later, in a flamboyant Gothic style. In the 17th and 18th centuries, the Mount, deserted by its administrator abbots, lost its importance in both military and religious terms. In 1622, the reform of the Congregation of Saint-Maur established a new religious order at the Abbey. They redeveloped the site and attempted to revive the monastic life and the pilgrimages. These monks also had to cope with the arrival of prisoners sentenced to imprisonment without trial, as the Abbey became a kind of "Bastille on the sea". 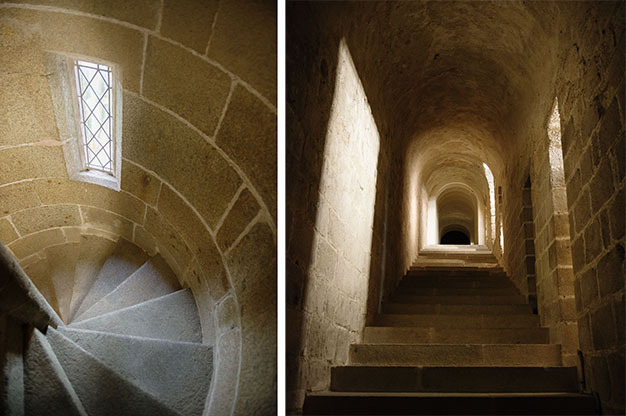 Following the Revolution, the property of the Church was declared "national property", the monks of Mont-Saint-Michel were driven away and the "Mont Libre" became a prison for refractory priests in 1793. In 1811, an Imperial decree transformed the Abbey into a reformatory, mainly for common law prisoners and some political prisoners, such as Armand Barbès and Auguste Blanqui. Photo: © Colombe Clier / Centre des monuments nationaux. "Mont St.-Michel. Large hoist, front view"
© Reproduction Pascal Lemaître / CMN - Author of photograph: Séraphin-Médéric Mieusement. Closed in 1863, the prison had the merit of saving the Abbey from destruction, but the monument was left in a state of severe dilapidation. 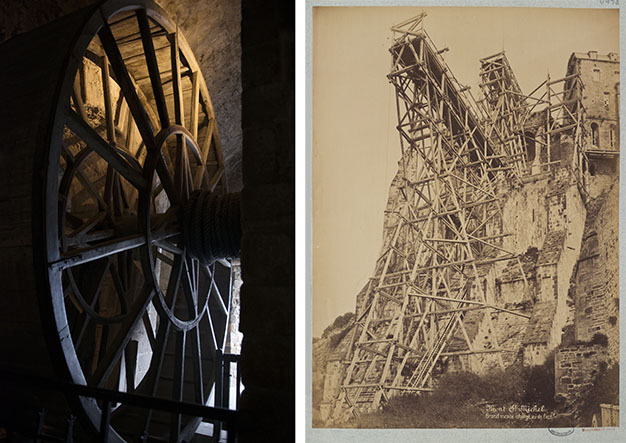 In 1874, the Abbey was classified as a historical monument and the long process of restoration began. A causeway, constructed in 1878, made access to the Mount easier, followed by a tramway line for transporting visitors, whose numbers continued to grow. In 1969, a small community of Benedictine monks was established at the Abbey, who were replaced in 2001 by the Monastic Fraternities of Jerusalem. 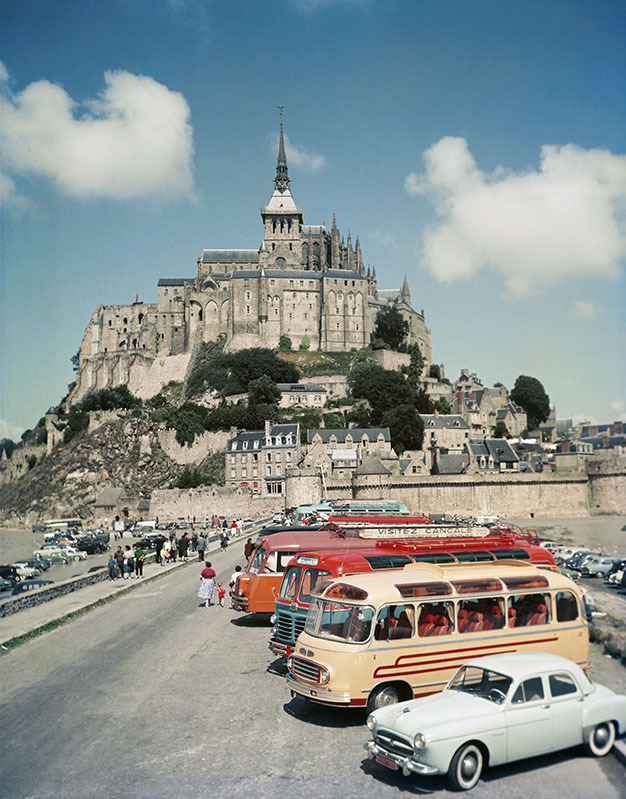 The actions by the State to conserve the site led to it being listed as a UNESCO World Heritage Site in 1979 under the title of "Mont-Saint-Michel and its bay". 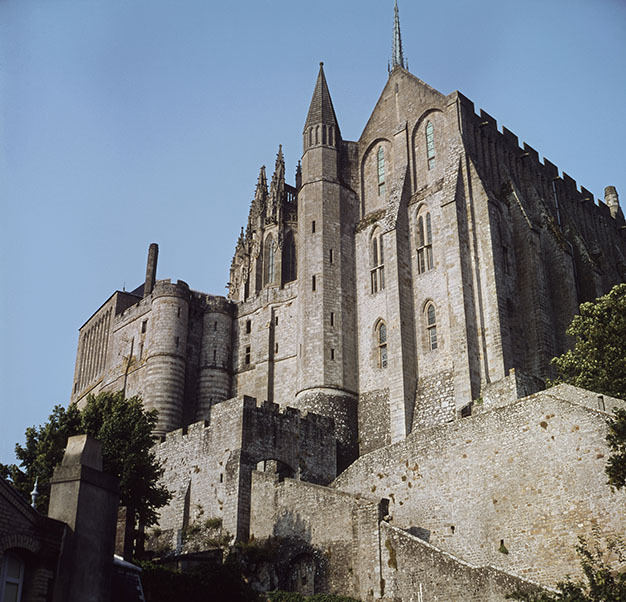 Mont-Saint-Michel was one of the first French cultural properties to be listed. Then in 1998, the site was also listed as a "Pilgrimage route to Santiago de Compostela, in France". This double recognition is evidence of the universal outstanding value of this monument. 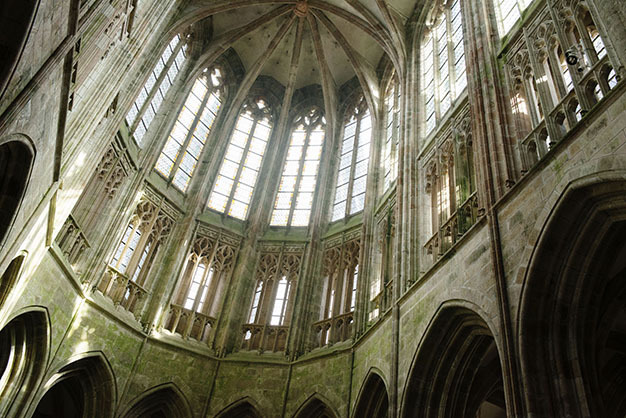 The thirteen centuries of history and the island location of the Mont-Saint-Michel Abbey are a constant challenge in terms of conservation and restoration. In addition to thepermanent upkeep needed for a site that receives so many visitors and is so exposed to the elements, the Centre des monuments nationaux carries out large-scale restoration campaigns, in which over 20 million euros have been invested since 2007. The Abbey therefore undergoes continuous building work, led by the Chief Architect of Historical Monuments. 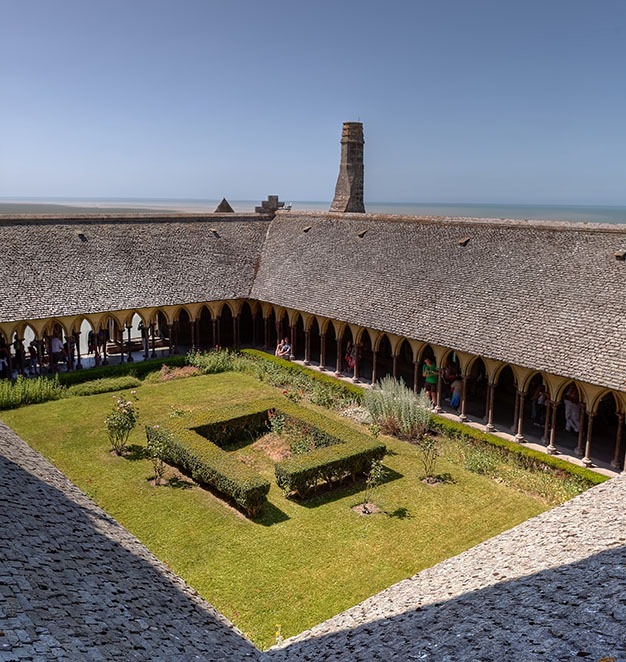 Every year, the many cultural events organised by the Centre des monuments nationaux help to increasethe number of visitorsin a monument whose conditions of access have been totally redesigned, in the chaplaincy and cellar.